In anticipation of the public name submission phase for the new Portland-Milwaukie Light Rail Bridge, TriMet will offer four “Bridge Talks.” The lunch-hour events will allow the public to hear firsthand about the bridge design and construction while viewing construction from the east bank of the Willamette River. TriMet Community Affairs Representative DeeAnn Sandberg will lead the discussions and answer questions; no reservations are necessary. Led by a committee of regional leaders and community members, the bridge naming process runs from September 2013 until spring 2014. The initial public name submission phase is October 17-December 1, 2013, with suggested bridge names being submitted via trimet.org. For more information, visit trimet.org/namethebridge. The bridge will be the first cable-stayed bridge for the region, extending 1,720 feet (.326 miles) over the Willamette River. The bridge alignment is SW Porter Street on the west side and SE Sherman Street on the east side. This unique bridge will carry transit, cyclists and pedestrians but no private vehicles. Emergency vehicles will be able to access the bridge if necessary. The 7.3-mile project is the region’s sixth MAX construction project to be built and extends from the terminus of the MAX Green and Yellow lines at Portland State University in Downtown Portland to South Waterfront, SE Portland, Milwaukie and North Clackamas County. 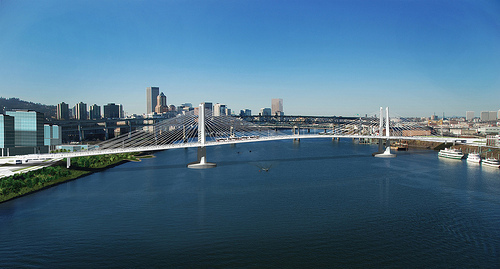 The first of its kind multi-modal bridge over the Willamette River that will carry light rail, buses, bikes, pedestrians and a future Portland Streetcar extension, but no private vehicles.